There is broad consensus that a price on carbon is an essential weapon in the fight against global warming, though there is disagreement whether Cap & Trade or a Carbon Tax is the best approach. CO2 acts globally, thus its impact on the environment is generally similar wherever in the globe it is released. So the location of the originator of the emissions does not really matter from an environmental standpoint. The International Energy Agency (IEA) estimates that CO2 emissions rose by 5.9 percent to 30.6 billion tonnes in 2010, the highest ever growth in history. Fatih Birol, IEA Chief Economist, warned that carbon dioxide emissions were already coming close to a target set by the 190-nation Cancun climate talks last year to limit global warming to less than 2 degrees Celsius above pre-industrial times. Three quarters of the growth came from emerging economies such as China or India. There are two main contenders for constraining carbon emissions: caps and taxes. Both are market-based approaches that put a price on carbon and other greenhouse gases and provide an economy-wide signal to encourage emission reductions, beginning with the lowest-cost opportunities. The main difference between the two is that a pure tax fixes the price of carbon (but allows the amount of carbon emissions to vary) while a pure cap places limits on carbon emissions (letting the market price of tradable carbon allowances vary). Hopes for a treaty to replace the Kyoto Protocol which expires in 2012 have dimmed since U.S. President Barack Obama and other world leaders failed to agree a binding pact at a summit in Copenhagen in 2009. Rich economies are reluctant to make substantial cuts in their emissions beyond 2012 without commitments from big developing economies like China and India to also curb their fast-rising emissions. Money promised to developing countries at Copenhagen to allow them to adjust to climate change still has not been delivered. In 2010 Environmental Ministers agreed a package of measures in Cancun, Mexico, that included a goal of limiting any temperature rise to below 2 degrees Celsius above pre-industrial times. But a group of scientists estimated that existing plans for cutting greenhouse gases so far put the world on a path to a rise of 3.2 degrees Celsius. Environment ministers will meet in Durban, South Africa, in November and December 2011 to try to agree Kyoto’s fate. This "Story of Stuff" Video is an editorial that points out some of the flaws of Cap & Trade. Acid Rain Program - A market-based initiative taken by the United States Environmental Protection Agency in an effort to reduce overall atmospheric levels of sulfur dioxide and nitrogen oxides, which cause acid rain. The program is an implementation of emissions trading that primarily targets coal-burning power plants, allowing them to buy and sell emission permits (called "allowances") according to individual needs and costs. two-phase tightening of the restrictions placed on fossil fuel-fired power plants. Phase I began in 1995 and affected 263 units at 110 mostly coal-burning electric utility plants located in 21 Eastern and Midwestern states. An additional 182 units joined Phase I of the program as substitution or compensating units, bringing the total of Phase I affected units to 445. Emissions data indicate that 1995 SO2 emissions at these units nationwide were reduced by almost 40 percent below their required level. emissions limits imposed on these large, higher emitting plants and also set restrictions on smaller, cleaner plants fired by coal, oil, and gas, encompassing over 2,000 units in all. The program affected existing utility units serving generators with an output capacity of greater than 25 megawatts and all new utility units. The U.S. Department of Energy in 1991 estimated the installed retrofit cost per ton of SO2 pollution control equipment (scrubbers) on existing units would be in the $665– $736/ton range. However, 2005 was the first year the price of an SO2 allowance reached this level. In fall 2006, a few trades were registered at slightly over $1,600/ton. At those rates, it was less expensive to install scrubbers and reduce air pollution than to purchase SO2 emissions allowances and continue polluting. Subsequently, the market price of SO2 allowances decreased to around $88/ton in August 2009. The Acid Rain program is widely viewed as being very successful, bringing about large reductions for lower-than-expected costs. Specifically, the program resulted in cost savings of $1 billion annually, compared with costs under direct regulatory alternatives, and SO2 emissions from the power sector decreased from 15.7 MT in 1990 to 10.2 MT in 2005 (Carlsom et al. 2000). Banking provisions contributed to the program’s cost-effectiveness (Ellerman et al. 2000). Analyses of the program indicate that it did not produce unintended consequences of concentrating SO2 emissions in minority communities, and improved air quality for minority and low-income populations (Ringquist, 2011: and U.S. EPA, 2005). Cap and Trade - A cap-and-trade system constrains the aggregate emissions of regulated sources by creating a limited number of tradable emission allowances, which emission sources must secure and surrender in number equal to their emissions. In an emissions trading or cap-and-trade scheme, a limit on access to a resource (the cap) is defined and then allocated among users in the form of permits. Compliance is established by comparing actual emissions with permits surrendered including any permits traded within the cap. Under a tradable permit system, an allowable overall level of pollution is established and allocated among firms in the form of permits. Firms that keep their emission levels below their allotted level may sell their surplus permits to other firms or use them to offset excess emissions in other parts of their facilities. competitive forces would lead to a single allowance price. Whatever you tax, you get less of. Today, America mainly taxes labor and capital—but we want more of both! We don’t want more carbon, so let’s tax that instead. Economist and former Undersecretary of Commerce Rob Shapiro supports the approach of a payroll tax rebate, arguing that cutting payroll taxes could spur job growth. Al Gore captured the idea with the phrase, “tax what we burn, not what we earn.” Former Rep. Bob Inglis (R-SC) introduced the “raise wages, cut carbon” bill co-sponsored by Rep. Jeff Flake (R-Az). Conservative economists Greg Mankiwand Douglas Holtz-Eakin, both of whom have advised Republican presidents and candidates, have also supported shifting tax burdens from payrolls to carbon emitters. And the Progressive Democrats of America endorsed the Larson bill. CO2E - Equivalent Carbon Dioxide - The concentration of CO2that would cause the same level of radiative forcing as a given type and concentration of greenhouse gas. Examples of such greenhouse gases are methane, perfluorocarbons and nitrous oxide. CO2e is expressed as parts per million by volume, ppmv. EMU - Emission Reduction Unit - Generated by a joint implementation project. 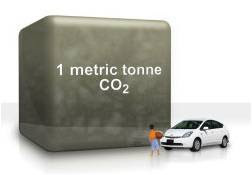 Equal to one tonne of CO2 can be traded and sold under the Kyoto Protocol’s emissions trading scheme. EJ - Environmental Justice - A broad effort to redress the disproportionate impact of environmental hazards and ensure that communities affected by those hazards have a seat at the decision‐making table. The Environmental Justice Movement arose out of communities experiencing environmental degradation, a broad river of social and political ferment growing out of such varied tributaries as the Civil Rights Movement, the farm worker movement, and the grassroots anti‐toxics movement. The Environmental Justice Movement has focused on ensuring that everyone has the right to a safe, clean and healthful environment. Kyoto Protocol - An international agreement linked to the United Nations Framework Convention on Climate Change. It sets binding targets for 37 industrialized countries and the European community for reducing greenhouse gas (GHG) emissions. These amount to an average of five per cent against 1990 levels over the five-year period 2008-2012. The major distinction between the Protocol and the Convention is that while the Convention encouragedindustrialised countries to stabilize GHG emissions, the Protocol commits them to do so. GWP - Global-Warming Potential - A relative measure of how much heat a greenhouse gas traps in the atmosphere. It compares the amount of heat trapped by a certain mass of the gas in question to the amount heat trapped by a similar mass of carbon dioxide. A GWP is calculated over a specific time interval, commonly 20, 100 or 500 years. GWP is expressed as a factor of carbon dioxide (whose GWP is standardized to 1). For example, the 20 year GWP of methane is 56, which means if the same weights of methane and carbon dioxide were introduced into the atmosphere, that methane will trap 56 times more heat than the carbon dioxide over the next 20 years. IPCC - Intergovernmental Panel on Climate Change - A scientific intergovernmental body tasked with reviewing and assessing the most recent scientific, technical and socio-economic information produced worldwide relevant to the understanding of climate change. It provides the world with a clear scientific view on the current state of climate change and its potential environmental and socio-economic consequences, notably the risk of climate change caused by human activity. The panel was first established in 1988 by the World Meteorological Organization (WMO) and the United Nations Environment Programme (UNEP). The IPCC does not carry out its own original research, nor does it do the work of monitoring climate or related phenomena itself. A main activity of the IPCC is publishing special reports on topics relevant to the implementation of the UN Framework Convention on Climate Change (UNFCCC), an international treaty that acknowledges the possibility of harmful climate change. Implementation of the UNFCCC led eventually to the Kyoto Protocol. The IPCC bases its assessment mainly on peer reviewed and published scientific literature. MAC - Marginal Abatement Cost - The cost of eliminating an additional unit of pollution — differs by country. It might cost China $2 to eliminate a ton of CO2, but it would probably cost Sweden or the U.S. much more. International emissions-trading markets were created precisely to exploit differing MACs. REC - Renewable Energy Certificates - (Also known as Green tags, Renewable Energy Credits, Renewable Electricity Certificates, or Tradable Renewable Certificates (TRCs),) Most states with RPS programs have associated renewable energy certificate trading programs. RECs provide a mechanism by which to track the amount of renewable power being sold and to financially reward eligible power producers. For each unit of power that an eligible producer generates, a certificate or credit is issued. These can then be sold either in conjunction with the underlying power or separately to energy supply companies. A market exists for RECs because energy supply companies are required to redeem certificates equal to their obligation under the RPS program. State specific programs or various applications (e.g., WREGIS, M-RETS, NEPOOL GIS) are used to track REC issuance and ownership. These credits can in some programs be 'banked' (for use in future years) or borrowed (to meet current year commitments). There is a great deal of variety among the states in the handling and functioning of RECs and this will be a major issue in integrating state and federal programs. RECs are sometimes treated as carbon offsets, although the concepts are distinct. Whereas a carbon offset represents a reduction in greenhouse gas emissions, a REC represents a quantity of energy produced from renewable sources. To convert RECs into offsets, the clean energy must be translated into carbon reductions, typically by assuming that the clean energy is displacing an equivalent amount of conventionally produced electricity from the local grid. This is known as an indirect offset (because the reduction doesn't take place at the project site itself, but rather at an external site), and some controversy surrounds the question of whether they truly lead to "additional" emission reductions and who should get credit for any reductions that may occur. RPS - Renewable Portfolio Standard - (also known as Renewable Electricity Standard (RES) at the United States federal level and Renewables Obligation in the UK.) - A regulation that requires the increased production of energy from renewable energy sources, such as wind, solar, biomass, and geothermal. The RPS mechanism places an obligation on electricity supply companies to produce a specified fraction of their electricity from renewable energy sources. Certified renewable energy generators earn certificates for every unit of electricity they produce and can sell these along with their electricity to supply companies. Supply companies then pass the certificates to some form of regulatory body to demonstrate their compliance with their regulatory obligations. Because it is a market mandate, the RPS relies almost entirely on the private market for its implementation. Unlike feed-in tariffs which guarantee purchase of all renewable energy regardless of cost, RPS programs tend to allow more price competition between different types of renewable energy, but can be limited in competition through eligibility and multipliers for RPS programs. Those supporting the adoption of RPS mechanisms claim that market implementation will result in competition, efficiency and innovation that will deliver renewable energy at the lowest possible cost, allowing renewable energy to compete with cheaper fossil fuel energy source. There is a growing debate whether Cap & Trade or a Carbon Tax is the best policy for reducing GHG's. Type of Instrument Quanity - Fixes the overall emission level (quantity) and allows the price to vary. Over longer horizons fixed emissions targets through emissions trading become increasingly advantageous. Only a hard cap ensures adherence to emission reduction targets while providing flexibility in how those targets are met. Price - Fixes the price while the emission level is allowed to vary according to economic activity. A predictable price, as imposed by a carbon tax, tends to have advantages over fixing the level of emissions through emissions trading for a short time horizon of several years. A major drawback of an emission tax is that the environmental outcome (e.g. a limit on the amount of emissions) is not guaranteed. Political Acceptability American politicians are not likely to agree to a tax on carbon, even a revenue neutral one. On the other hand, Republicans don't like Cap & Trade either which languished in the US Senate legislation languished. By the spring of 2010, the concept was in wide disrepute, with opponents effectively branding it "cap and tax," and Tea Party followers using it as a symbol of much of what they say is wrong with Washington. Developing countries are not likely to agree that a cap on their carbon emissions from a low base is equitable. However, a carbon tax could be recycled through developing economies. Most analysis shows that energy taxes, like sales taxes, are highly regressive. After all, it's not the rich people driving around old cars with poor mileage, living in old houses with poor insulation and inefficient appliances, have limited career mobility and lengthy commutes from poor communities into where the jobs are in wealthier communities. Timeliness Replacing cap-and-trade with new regulatory requirements would introduce regulatory uncertainty just as AB 32 is poised to go into effect in California. 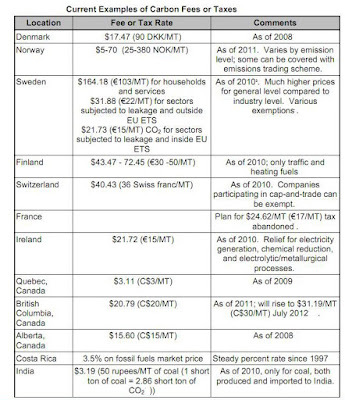 In theory, Carbon taxes can be implemented much sooner than complex cap-and-trade systems. Because of the urgency of the climate crisis, we do not have the luxury of waiting while the myriad details of a cap-and-trade system are resolved through lengthy negotiations. Market Manipulation The protracted negotiations necessary to implement a cap-and-trade system will provide constant opportunities for the fossil fuel industry and other invested parties to shape a system that maximizes their financial self-interests as opposed to an economically efficient system that maximizes societal well-being. If allowances are allocated based on some type of baseline reflecting past pollution (which has been the practice with NOx and SO2 trading programs), rather than being auctioned, polluters will have perverse incentives to maximize emissions before the cap-and-trade system goes into effect in order to “earn” those pollution rights. The political horse trading involved in defining a cap centers on distributing a fixed number of allowances—with equity and economic productivity implications but with no impact on future emissions levels. 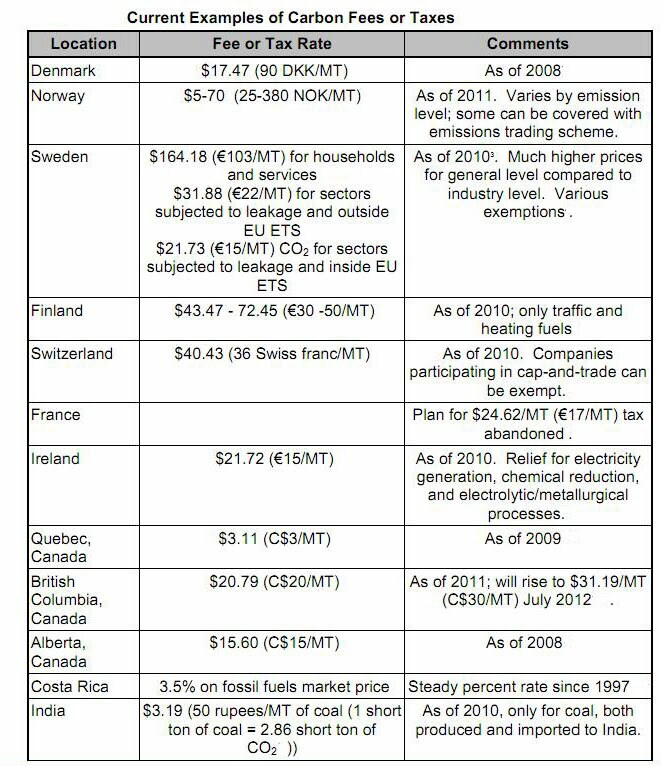 In contrast, negotiations to define a carbon tax might result in exemptions for certain sectors, which would allow higher emissions levels. Transparency A well-designed cap offers superior investor certainty relative to a tax because it establishes clear, long-term abatement requirements and allows the private sector to estimate the allowance prices needed to get the job done. In contrast, a carbon tax would likely start too low given political pressures and it would be exposed to unpredictable adjustments, as politicians would tend to raise or lower the tax in reaction to economic conditions. Carbon taxes are transparent and easily understandable, making them more likely to elicit the necessary public support than an opaque and difficult to understand cap-and-trade system. Conversely, cap-and-trade programs will offer an incentive to game the system; so pollsters and lobbyists will get to work. Efficiency Cap-and-trade insures that the emission targets are met at the lowest cost, with maximum flexibility to capped emitters. The cost of eliminating an additional unit of pollution — differs by country. It might cost China $2 to eliminate a ton of CO2, but it would probably cost Sweden or the U.S. much more. International emissions-trading markets were created precisely to exploit differing MACs. The burden of a volatile market will be borne by the controlling (taxing) agency rather than the industry itself, which is generally less efficient. Carbon taxes target carbon emissions in all sectors — energy, industry and transportation — whereas at least some cap-and-trade proposals are limited to the electric industry. It would be unwise to ignore the non-electricity sectors that account for 60% of U.S. CO2 emissions. Environmental Risk Some scientists have warned of a threshold in atmospheric concentrations of carbon dioxide beyond which a run-away warming effect could take place, with a large possibility of causing irreversible damages. If this is a conceivable risk then a quantity instrument could be a better choice because the quantity of emissions may be capped with a higher degree of certainty. However, this may not be true if this risk exists but cannot be attached to a known level of GHG concentration or a known emission pathway. Since there is no agreed-upon trajectory of emissions for achieving climate stability and preventing disaster. The real target for which the U.S. must aim is to reduce carbon emissions as much as possible, and then more. Traditional forms of regulation—technology and performance standards—represent an alternative to emissions trading or CO2 taxes, but can be much more costly because they do not allow the flexibility to shift efforts toward the cheapest mitigation opportunities. As a complement to emissions trading or CO2 taxes, however, flexible standards can address possible additional market failures and potentially lower costs. Cap-and-trade programs impose exactly the same emission-monitoring requirements as taxes. What affects monitoring costs is rather the "point of regulation." Assuming no corruption and assuming that the controlling agency and the industry are equally efficient at adapting to volatile market conditions, the best choice depends on the sensitivity of the costs of emission reduction, compared to the sensitivity of the benefits (i.e., climate damages avoided by a reduction) when the level of emission control is varied. The theoretical differences between a tax and trading policy are easily blurred in a hybrid emissions trading system where some allowances are auctioned to raise government revenue and where banking, borrowing or other flexible cost containment mechanisms are in place to help stabilize prices. A third option, known as a safety valve, is a hybrid of the price and quantity instruments. The system is essentially an emission cap and permit trading system but the maximum (or minimum) permit price is capped. Emitters have the choice of either obtaining permits in the marketplace or purchasing them from the government at a specified trigger price (which could be adjusted over time). The system is sometimes recommended as a way of overcoming the fundamental disadvantages of both systems by giving governments the flexibility to adjust the system as new information comes to light. It can be shown that by setting the trigger price high enough, or the number of permits low enough, the safety valve can be used to mimic either a pure quantity or pure price mechanism. Participating countries had equally effective monitoring and enforcement provisions. Less effective monitoring, lower penalties, or less rigorous enforcement in any given country would reduce the economic incentive provided by its tax and would be equivalent to reducing the country’s tax rate. over steel industries in other countries with the same tax but no exemption. that were sold to a country with a downstream tax on fossil fuel users in order to avoid double-taxing emission. transactions, penalties for noncompliance, and enforcement provisions. In contrast with a harmonized tax, lax monitoring or enforcement in one country would undermine the effectiveness of the policy not only in that country but in other participating countries as well. The country with lax enforcement could become a supplier of fraudulent allowances (ones that did not correspond to actual reductions), diminishing the environmental integrity of the entire trading system. Further, the systems that track and transfer allowances in different countries (referred to as “registries” in the EU) would need to be able to communicate with each other. Finally, as with a harmonized tax, each country’s cap-and-trade program would need to cover similar sources of emissions, and provisions would need to be made to avoid double charging (or not charging for) emissions if countries applied their caps at different points in the carbon supply chain. The change in the price of allowances would alter the gains and losses experienced by companies that, before linking, had been net buyers or net sellers of allowances. For example, if the United States experienced an increase in the price of allowances as a result of linking, U.S. firms that had been net sellers could benefit, whereas net buyers could be worse off. In addition to altering the gains and losses experienced by individual firms, linking would create net flows of allowances—and flows of resulting revenues—into, or out of, ountries. Countries could have an incentive to choose their caps strategically so as to take advantage of those potential flows. For example, a country might try to choose a less stringent cap so that it could become a net supplier of allowances. A change in the price of allowances as a result of linking could alter the incentive of domestic producers to invest in new technologies—such as energy efficiency improvements or alternative fuels—that would reduce CO2 emissions. My Bottom Line - In theory a cap-and-trade system and a tax can be designed to be similar with respect to their coverage, their effects, and, to some extent, their administrative costs. For example, both can be equally imposed upstream or downstream, equally grandfather existing emissions, raise the same revenue, and, at least roughly, provide the same level of price certainty and emissions certainty. But this all depends on how well the systems are designed. The disagreement seems to be largely about which one will be susceptible to bad design decisions, or more crudely, which one will Congress screw up more. Congress is good at writing bad tax laws; would it also bungle a cap-and-trade regime? And will the administrative costs of a cap-and-trade regime as actually implemented exceed those of a tax as actually implemented? Protect at Risk Real Estate - In California, $2.5 trillion in real estate assets are at risk from extreme weather events, sea level rise, and wildfires, with a projected annual price tag of $300 million to $3.9 billion over this century, depending on how warm the world gets. Avoid Economic Loss- In California in the face of rising temperatures, six economic sectors -- water, energy, transportation, tourism and recreation, agriculture, and public health-- would together incur tens of billions per year in direct costs, even higher indirect costs, and expose trillions of dollars of assets to collateral risk. Conserve Water - In California, water supply costs due to scarcity and increased operating costs would increase as much as $689 million per year by 2050. Researchers found that changes in yields (mostly negative) and changes in water availability could result in gross revenue losses of up to $3 billion by 2050. Avoid Wildfires - Costly wildfires will continue to increase. Scientists estimate that wildfire risk will increase throughout the end of the century. In California, average annual monetary impacts due to home loss may plausibly be on the order of $2 billion per year by mid-century and up to $14 billion per year by the end of the century. Relative Low Cost of CER's - With costs of emission reduction typically much lower in developing countries than in industrialized countries, industrialised countries can comply with their emission reduction targets at much lower cost by receiving credits for emissions reduced in developing countries as long as administration costs are low. The IPCC has projected GDP losses for OECD Europe with full use of CDM and Joint Implementation to between 0.13 and 0.81% of GDP versus 0.31 to 1.50 Climate Change 2001 - Synthesis report. Figure SPM-8] IPCC, 2001 with only domestic action. While there would always be some cheap domestic emission reductions available in Europe, the cost of switching from coal to gas could be in the order of €40-50 per tonne CO2 equivalent. CERs from CDM projects were in 2006 traded on a forward basis for between €5 and € 20 per tonne CO2 equivalent. Enforcement - Countries have an incentive to sell their permit allocations for foreign entities to generate cash and then not enforce the resulting emission reductions in their local industries. A permit allocation to a corrupt government is like free money, something we try not to do in the development context. The alternative is to only allow sales of permits by countries with good enforcement records, but if permit buyers are held hostage to local enforcement by governments of various sorts around the world, the permit market will lose many of its benefits and possibly even fail. Grandfathering of Allowances - Countries within the EU ETS have granted their incumbent businesses most or all of their allowances for free. This can sometimes be perceived as a protectionist obstacle to new entrants into their markets. There have also been accusations of power generators getting a 'windfall' profit by passing on these emissions 'charges' to their customers. As the EU ETS moves into its second phase and joins up with Kyoto, it seems likely that these problems will be reduced as more allowances will be auctioned. General Electric, DuPont, Alcoa, Caterpillar and other industrial pigpens this week endorsed cap-and-trade limits on carbon dioxide, which would turn their established habit of using the atmosphere as a free waste disposal into property right, worth billions. Talk about a low-hanging fruit. They are accustomed to treating carbon dumping as a gimme. Now they’d at least be in a position to get paid for dumping less. Carbon leakage - The effect that regulation of emissions in one country/sector has on the emissions in other countries/sectors that are not subject to the same regulation. There is no consensus over the magnitude of long-term carbon leakage. The leakage rate is defined as the increase in CO2 emissions outside of the countries taking domestic mitigation action, divided by the reduction in emissions of countries taking domestic mitigation action. Accordingly, a leakage rate greater than 100% would mean that domestic actions to reduce emissions had had the effect of increasing emissions in other countries to a greater extent, i.e., domestic mitigation action had actually led to an increase in global emissions. Estimates of leakage rates for action under the Kyoto Protocol ranged from 5 to 20% as a result of a loss in price competitiveness, but these leakage rates were viewed as being very uncertain. For energy-intensive industries, the beneficial effects of Annex I actions through technological development were viewed as possibly being substantial. This beneficial effect, however, had not been reliably quantified. On the empirical evidence they assessed, Barker et al.. (2007) concluded that the competitive losses of then-current mitigation actions, e.g., the EU ETS, were not significant. The EU is allocating emission allowances free of charge aimed at limiting impact of leakage and the costs for EU industries in relation to competitors outside of the EU. If other developed countries and other major emitters of greenhouse gases do not take comparable action to reduce their emissions, certain energy-intensive sectors in the EU that are subject to international competition could be put at an economic disadvantage. At the same time, an absence of comparable action outside of the EU could lead to an increase in greenhouse gas emissions in third countries where industry is not subject to comparable carbon constraints. This would undermine the environmental integrity and benefit of actions by the EU. To address these issues, industrial sectors that face international competition from industries outside the EU which are not subject to comparable climate legislation will receive a higher share of free allowances than those which are not at the risk of carbon leakage. Equitable Benchmarks - Benchmarking is the setting of emission reduction commitments measured against a particular base year. For example, take two countries that have identical emission reduction commitments as measured against the 1990 base year. This might be interpreted as being equitable, but this is not necessarily the case. One country might have previously made efforts to improve energy efficiency in the years preceding the benchmark year, while the other country had not. 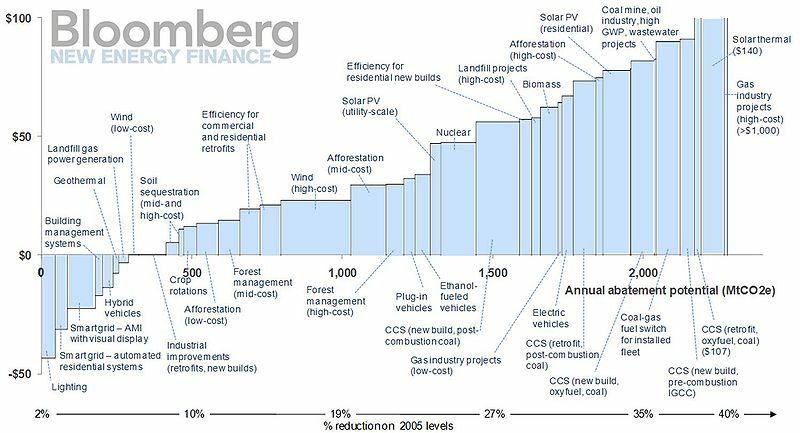 In economic terms, the marginal cost curve for emissions reductions rises steeply beyond a certain point. Thus, to meet its emission reduction commitment, the country with initially high energy efficiency might face high costs. But for the country that had previously encouraged over-consumption of energy, e.g., through subsidies, the costs of meeting its commitment would potentially be lower. Equity between Rich and Poor Nations - Developing nations’ current demand is an extension of Kyoto, which obliges almost 40 industrialized states to cut greenhouse gas emissions by 5.2 percent below 1990 levels from 2008-12. But Japan, Canada and Russia insist they will not extend their Kyoto cuts, arguing a new pact is needed for big emitters including China and India which have no 2012 curbs under Kyoto. And the U.S. never ratified the treaty. Delegates say the minimum deal envisioned by developing nations is for a core group, led by the EU, to extend Kyoto. The EU says it will not go it alone since it accounts for just 11 percent of world greenhouse gases. Modifying the stringency of the cap from year to year on the basis of the price of allowances. - Carbon Tax (which started at $10/t CO2 in 2008 and rises $5/t each year — it notches up to $25 per metric ton on July 1) launched with a distribution of a $100 direct “dividend” to each taxpayer even before the carbon tax was levied, and is now returning revenue via cuts in payroll, income and corporate tax rates. Former BC Premier Gordon Campbell was re-elected to a third term in 2009 after enacting the carbon tax with this mix of revenue return measures, perhaps indicating that a diverse approach to revenue return can have broad and sustained appeal. As of July 1 2010, the carbon tax was $20 per tonne of CO2, or about 4.6 cents on a litre of gasoline. When it was introduced back in 2008, the carbon tax dedicated about one-third of revenues to a low-income credit (the remainder going to personal and corporate income tax cuts). This was a big positive with households in the bottom 40% of the distribution slightly better off on average, with credits exceeding taxes paid. 2009's increase to $15 a tonne wiped out that gain because the low income credit barely increase in value (from $100 per adult to $105), while the carbon tax grew by 50%. The 2010 increment to the carbon tax made the whole regime slightly regressive – meaning a bigger hit to low-income families relative to their income; they will be absolutely worse off even after considering the credits. For the bottom 40%, the numbers are not huge – about a $30 per year loss, the 2010 budget increased the credit another ten bucks to $115.50 per adult. European Union - EU ETS - Emissions Trading Scheme (Also known as the European Union Emissions Trading System) - The largest multi-national emissions trading scheme in the world. It was launched in 2005 and is a major pillar of EU climate policy. The EU ETS currently covers more than 10,000 installations with a net heat excess of 20 MW in the energy and industrial sectors which are collectively responsible for close to half of the EU's emissions of CO2 and 40% of its total greenhouse gas emissions. Under the EU ETS, large emitters of carbon dioxide within the EU must monitor and annually report their CO2 emissions, and they are obliged every year to return an amount of emission allowances to the government that is equivalent to their CO2 emissions in that year. In order to neutralize annual irregularities in CO2-emission levels that may occur due to extreme weather events (such as harsh winters or very hot summers), emission credits for any plant operator subject to the EU ETS are given out for a sequence of several years at once. Each such sequence of years is called a Trading Period. The 1st EU ETS Trading Period expired in December 2007; it had covered all EU ETS emissions since January 2005. With its termination, the 1st phase EU allowances became invalid. Since January 2008, the 2nd Trading Period is under way which will last until December 2012. Currently, the installations get the trading credits from the NAPS (national allowance plans) which is part of each country's government. Besides receiving this initial allocation, an operator may purchase EU and international trading credits. If an installation has performed well at reducing its carbon emissions then it has the opportunity to sell its credits and make a profit. this allows the system to be more self contained and be part of the stock exchange without much government intervention. The first phase of the European Union Emissions Trading System, which ran from 2005-2008, had limited effectiveness due to over-allocation of permits. This was a regulatory design flaw because the Europeans had not been able to do a hard verification of emissions from capped entities before setting their targets. Permit allocation was reduced in second phase, now underway through 2012. Other “failures” of the European experience with cap-and-trade, such as breaches into computerized accounts and sale of stolen allowances, are likewise a result of design flaws, botched execution, or having 27 different systems for each of the EU members. The European Commission and Parliament decided, during the ETS design and legislative process (2001-2003), that allowances should be granted for free to most participants in the first two phases of the trading system (2005-2012 inclusive). This was done to ensure the softest of starts for the EU economy, particularly for industries that exported outside the EU, or competed with imports, and therefore couldn’t pass on carbon costs to their customers. What was less recognized at the time, although anticipated by a number of observers, was that in some electricity markets, particularly the deregulated UK market, the carbon price that traded at the margin would be the one that set the electricity price, thereby granting those holding free allowances infra-marginal rent. In January 2008, the European Commission proposed a number of changes to the scheme, including centralized allocation (no more national allocation plans) by an EU authority, a turn to auctioning a greater share (60+ %) of permits rather than allocating freely, and inclusion of other greenhouse gases, such as nitrous oxide and perfluorocarbons. These changes are still in a draft stage; the mentioned amendments are only likely to become effective from January 2013 onwards, i.e. in the 3rd Trading Period under the EU ETS. 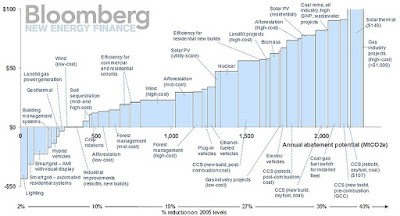 Also, the proposed caps for the 3rd Trading Period foresee an overall reduction of greenhouse gases for the sector of 21% in 2020 compared to 2005 emissions. The EU ETS has recently been extended to the airline industry as well, but these changes will not take place until 2012. In June 2011, the United States demanded that the European Union exempt U.S. airlines from rules regulating greenhouse emissions, a move that makes more likely the prospect of a lengthy trans-Atlantic dispute. The cap for the year 2013 has been determined at 2,039,152,882 allowances, that is just under 2.04 billion allowances.This is not the final 2013 cap. There will be an increase in auctioning levels—at least 50 percent of allowances will be auctioned from 2013, compared to about 3 percent in Phase II. This will improve the economic efficiency of the EU ETS. In most EU Member States, there will be 100 percent auctioning for the power sector. Access to project offsets under the Kyoto Protocol from outside the EU will be limited to no more than 50 percent of the reductions required in the EU ETS. This is a reduction from Phase II. It means a much larger share of emission reductions will happen within the EU borders. Twelve percent of the total allowances auctioned will be redistributed to Member States with lower gross domestic product (GDP) in the interests of solidarity. These are mostly the newer eastern Member States. EU Member States propose to spend at least half of the revenues from auctioning to tackle climate change both in the EU and in developing countries. Due to international competitiveness and leakage concerns, industrial sectors will be allocated allowances for free on the basis of product benchmarks. The benchmarks will be set on the basis of the average of the top 10 percent most greenhouse gas–efficient installations in the EU. Sectors deemed at significant risk of relocating production outside of the EU because of the carbon price—carbon leakage—will receive 100 percent of the benchmarked allocation for free. Sectors not deemed at significant risk of carbon leakage will receive 80 percent of their benchmarked allocation for free in 2013, declining to 30 percent in 2020 and 0 percent in 2027. Up to 300 million allowances from the new entrants’ reserve of the EU ETS will be used to support the demonstration of carbon capture and storage (CCS) and innovative renewable technologies. Member States may exclude small emitters and hospitals so as to reduce regulatory burden. California - AB 32 - The Global Warming Solutions Act of 2006 - California State Law that fights climate change by establishing a comprehensive program to reduce greenhouse gas emissions from all sources throughout the state. AB 32 was authored by Assembly Speaker Fabian Nunez (D-Los Angeles) and signed into law by Governor Arnold Schwarzenegger on September 27, 2006. AB 32 requires the California Air Resources Board (CARB) to develop regulations and market mechanisms to reduce California's greenhouse gas emissions to 1990 levels by 2020, representing a 25% reduction statewide, with mandatory caps beginning in 2012 for significant emissions sources. The bill provides the Governor the ability to suspend the emissions caps for up to one year in the case of an emergency or significant economic harm. Cap-and-Trade Program: Firm limit on total greenhouse gas emissions. Covers 85% of all emissions statewide; including electricity generation, large industrial sources, transportation fuels, and residential and commercial use of natural gas, and provides regional linkage with the Western Climate Initiative. In December, 2010 ARB adopted guidelines for a cap-and-trade program that will take effect beginning in 2012, with a limit placed that year that will be reduced by two percent each year through 2015 and three percent each year from 2015 to 2020. The rules apply first to utilities and large industrial plants, and in 2015 will begin to be applied to fuel distributors as well, eventually totaling 360 businesses at 600 locations throughout the State of California. Free credits will be distributed to businesses to account for about 90 percent of overall emissions in their sector, but they must buy allowances, or credits, to account for additional emissions. Offsets - actions, such as the planting of trees, that absorb greenhouse gases, can also be relied upon to account for up to 8 percent of emissions. Electricity and Energy: Improved appliance efficiency standards and other energy efficiency measures; RPS for 33% of energy to come from renewable sources by 2020; increased use of efficient “combined heat and power”; Million Solar Roofs, Solar Hot Water Heating; Green Buildings; and water efficiency. High Global Warming Potential Gases: reduce emissions and use of refrigerants and certain other gases that have much higher impact, per molecule than carbon dioxide through leak-resistant equipment, restrictions on use, and fees. Agriculture: more efficient agricultural equipment, fuel use and water use through transportation and energy measures; reductions from manure digesters at dairies; address impacts on productivity of crops and livestock. Transportation: Reduction of 30% in vehicle greenhouse gas emissions by 2016 (known as the ‘Pavley standards’) followed by further reductions from 2017. Decrease 10% by 2020 carbon intensive vehicle fuels through the low-carbon fuel standard. Lastly, changes in the way we build, plan and develop our cities through better land-use planning (SB 375). Other transportation measures include more efficient delivery trucks, heavy duty trucks and goods movement. Adopt a regulation requiring the mandatory reporting of greenhouse gas emissions. In December 2007 ARB adopts a regulation requiring the largest industrial sources to report and verify their greenhouse gas emissions. Identify and adopt regulations for discrete early actions that could be enforceable on or before January 1, 2010. In February 2008 ARB approved a policy statement encouraging voluntary early actions for emissions reductions and establishing a procedure for project proponents to submit quantification methods to be evaluated by ARB. To date, ARB has identified nine discrete early action measures to reduce greenhouse gas emissions, including regulations affecting landfills, motor vehicle fuels, refrigerants in cars, tire pressure, port operations and other sources. Regulatory development for additional measures is ongoing. Convene an Environmental Justice Advisory Committee (EJAC) to advise the Board in developing the Scoping Plan and any other pertinent matter in implementing AB 32. The EJAC has met 12 times since early 2007 and submitted comments and recommendations on the scoping plan in October 2008. Among the plaintiffs in the court case against AB32 are members of the EJAC, which advised ARB on the creation of the Scoping Plan and made its objections to the plan plain from the start. Appoint an Economic and Technology Advancement Advisory Committee (ETAAC) to provide recommendations for technologies, research and greenhouse gas emission reduction measures. The Economic and Technology Advancement Advisory Committee (ETAAC) submitted a report of their recommendations to the Board in February 2008. The ETAAC also reviewed and provided comments on the scoping plan. In 2010, the attorneys general of Alabama, Nebraska, Texas and North Dakota worked on a legal strategy to challenge AB32, on the grounds that it interferes with the right to freely conduct interstate commerce. In November 2010 a ballot initiative challenge to the bill was defeated by California voters by a wide margin. Proposition 23 aimed to suspend AB 32 until state unemployment stayed below 5.5% for four consecutive quarters, a rare occurence in the last 30 years. In 2010, a coalition of environmental justice advocates sued CARB in an attempt to invalidate the A.B. 32 Scoping Plan, as well as CARB’s environmental review of the Scoping Plan conducted pursuant to the California Environmental Quality Act (CEQA). The legal challenge claims that CARB unfairly burdened low-income communities and communities of color in its implementation plan to reduce greenhouse gas emissions and erroneously adopted a scoping plan. The lawsuit further challenges CARB for non-compliance with the California Environmental Quality Act and for violation of AB32’s statutory mandates. In March 2011, the California Superior Court concluded that the state failed to conduct adequate environmental review of its implementation decisions under CEQA. In particular, the court holds that the Air Resources Board (1) failed to consider adequately alternatives to the mix of measures adopted in the Scoping Plan, including especially alternatives to cap-and-trade measures, such as a direct carbon tax; and (2) improperly began implementing the Scoping Plan measures before its CEQA process was complete. The court did not agree in toto with plaintiffs’ claims challenging the environmental review, but all you need is one CEQA flaw to require additional or amended environmental review. Judge Goldsmith found that CARB’s analysis of environmental impacts associated with the Scoping Plan was acceptable, but the analysis of alternatives to the Scoping Plan’s proposed programs and regulations was inadequate. 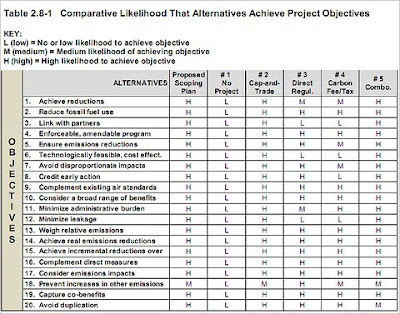 CARB did not undertake an adequate analysis of the impacts of each proposed alternative to the mix of preferred greenhouse gas reduction measures presented in the Scoping Plan, in particular the alternative for use of a carbon fee or tax. The court upheld the Scoping Plan, but agreed with plaintiffs that there were some flaws in CARB's analysis of the total potential costs and total potential economic benefits of the Scoping Plan to the state's economy, environment, and public health. Overall, however, the court found that plaintiffs' criticisms on this point were over broad and fell short of demonstrating that the agency's actions were arbitrary and capricious in violation of its duty to analyze the costs and benefits of direct regulation of greenhouse gas emissions and the cap-and-trade approach. In May 2011, a "final" ruling from a Superior Court judge in San Francisco allowed most implementation of the 2006 Global Warming Solutions Act to go forward, except for the carbon trading plan known widely as "Cap & Trade." Regulators at the California Air Resources Board (ARB) will have to flesh out their prior assessment of alternatives to Cap & Trade that could also result in reducing the state's total greenhouse gas emissions. CARB will very likely appeal and will very likely seek (and may well win) a stay of the injunction preventing the Scoping Plan (which sets forth how CARB will implement AB 32) from going into effect. Second, if CARB succeeds in getting the injunction stayed, it can work during the lengthy appellate process to fix the violations of CEQA so that even if CARB loses on appeal it loses no implementation time. The violations are largely about conducting a more thorough analysis of alternatives to the Scoping Plan. The state won on all of the plaintifffs’ claims that the Scoping Plan violates AB 32 itself. The court decision is highly deferential to the complex decisions CARB has had to make in implementing legislation that requires economy wide limitations on greenhouse gases. The state also won on one of the principal CEQA claims, that the programmatic review CARB conducted is sufficiently detailed. In June 2011, CARB released a draft of the revised analysis of alternatives starting the clock for a 45-day public-comment period. 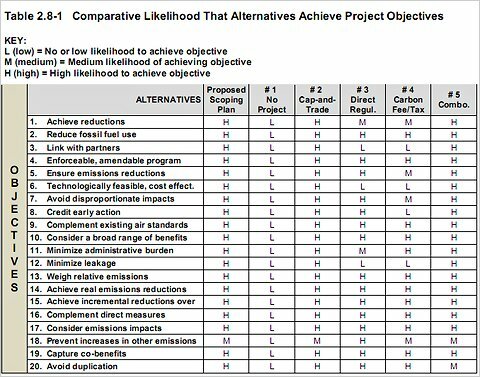 Included in the analysis was the chart below, which summarizes how different approaches to controlling emissions are expected to score on 20 different yardsticks. By this reckoning, a cap-and-trade strategy, the market-based emissions trading system that the air resources board has already embraced, still scores highest. A hybrid approach combining elements of both a cap-and-trade system and a carbon fee is a close second. What Judge Ernest H. Goldsmith called for was a fuller discussion of the comparative merits of a cap-and-trade system, which the board had embraced, and a direct tax or fee on emissions of carbon dioxide or other greenhouse gases, an approach favored by several leading economists. The 116-page document looked at the following four alternatives for enforcing AB32: relying only on existing laws and policies (the so-called “no action” alternative), directly regulating polluting industries, imposing a carbon fee or tax, and using the cap-and-trade approach. It also provided a discussion of British Columbia’s plan, a blend of these policies. The staff’s final judgment was that a market-based approach easily outdistanced a direct emissions tax or fee. In June 2011, in the wake of a lawsuit filed by environmental groups, California decided to delay enforcement of its greenhouse gas cap-and-trade program by one year to give the state more time fine-tune the scheme. The head of the California Air Resources Board (CARB) said that polluters wouldn't have to comply with the emissions trading program until 2013, but it would still begin in 2012. "We will be testing the system, doing simulation models, but no one will be held accountable during that year for compliance," CARB Chairwoman Mary Nichols told legislators Wednesday, ClimateWire reported. "But at the end of 2014, people will still be where they would have been if the program had started on time ." A summary of how various approaches to controlling emissions are expected to meet 20 objectives set by California air regulators. - The debt ceiling deal struck in August between President Obama and congressional leaders contains two key concessions. Republicans sacrificed a future second vote to raise the debt ceiling next winter, closer to the presidential election. And Democrats surrendered tax increases, sending a signal to some climate advocates that reducing the deficit with revenue from a carbon tax is now more difficult. Robert Stavins, an economist at the Harvard Kennedy School of Government, criticized the debt deal as evidence of growing conservative influence in Washington. That, combined with the "demonstrated willingness of [the] White House to capitulate to conservative Republicans, will embolden those who oppose climate policy of any kind," he said in an email. The debt agreement establishes a 12-member bipartisan commission to recommend spending cuts and new taxes that would reduce the deficit by $1.5 trillion over a decade. Congress must vote on the plan by Dec. 23, or face automatic cuts to Pentagon and agency spending beginning in 2013. The panel could consider a carbon tax during a broad effort to overhaul the tax code and identify cuts that satisfy the requirements of the debt deal, said Joseph Aldy, an economist who developed climate policy for Obama until late last year. "A carbon tax could be an appealing alternative to even more ambitious cuts to entitlements and defense spending as well as a national value-added tax, repealing the home mortgage tax deduction, or higher income taxes," Aldy said in an email. "A well-designed carbon tax could raise some revenues to finance deficit reduction and enable a reduction in payroll tax rates, for example." The future panel, Aldy said, might be influenced by the recent findings of a debt commission led by former Sen. Pete Domenici (R-N.M.) and Alice Rivlin, a Democrat and the founding director of the Congressional Budget Office. They determined that a $23-per-ton carbon tax could raise about $1.1 trillion by 2025 while cutting carbon dioxide emissions 10 percent below 2005 levels. In the end, though, the Domenici-Rivlin commission recommended a national sales tax over the carbon tax. Still, a former Democratic aide who is promoting climate policies believes the debt deal formalizes the discussion around new revenue. In a "rational" world, that debate would naturally lead to the benefits of taxing pollution over paychecks, this person said. "I personally think the likelihood of a big tax deal has increased," the former aide said, noting that carbon revenue could be combined with lower tax rates for people and corporations. California Climate Action Registry, Los Angeles - Created by the State of California in 2001 to address climate change through voluntary calculation and public reporting of emissions. The California Registry established protocols to guide emissions inventory reporting and served as a central database for emissions reports. As the California Registry grew and became more successful, the need became apparent for emissions reporting to exist in an integrated system that stretched beyond California’s borders. For this reason, the California Registry was involved in establishing The Climate Registry with the mission of expanding the California Registry’s emissions reporting work to include all of North America. Emissions inventory reporting is being transitioned to The Climate Registry, and reports for the 2009 reporting year will be the last the California Registry will accept. However, even after that year, the California Registry will continue to represent its members’ emissions reports to the State of California. CARROT, the California Registry's online GHG reporting and calculation tool became read only on December 31, 2010. CCX - Chicago Climate Exchange - The U.S.’s only emissions credit exchange, closed shop at the end of 2010 citing a lack of legislative interest. While voluntary, the exchange was legally binding, and counted among its members Dupont, Motorola and IBM. The exchange will lay off its employees gradually over the next few weeks, and in 2011 Intercontinental will launch a new registry for carbon offsets, but for now, the company is focusing its emissions trades where it’s profitable: on the European market. Indeed, even as the price of carbon has plummeted in the US, prices in the European Trading Scheme have risen steadily in recent months, and are projected to reach €40 per tons of CO2e in 2011. Climate Action Reserve, Los Angeles - A national offsets program working to ensure integrity, transparency and financial value in the U.S. carbon market. It does this by establishing regulatory-quality standards for the development, quantification and verification of greenhouse gas (GHG) emissions reduction projects in North America; issuing carbon offset credits known as Climate Reserve Tonnes (CRT) generated from such projects; and tracking the transaction of credits over time in a transparent, publicly-accessible system. Adherence to the Reserve’s high standards ensures that emissions reductions associated with projects are real, permanent and additional, thereby instilling confidence in the environmental benefit, credibility and efficiency of the U.S. carbon market. The Climate Registry, Los Angeles - A nonprofit collaboration among North American states, provinces, territories and Native Sovereign Nations that sets consistent and transparent standards for businesses and governments to calculate, verify and publicly report greenhouse gas emissions into a single unified registry. The Climate Registry Information System (CRIS) is The Registry’s online greenhouse gas (GHG) calculation, reporting, and verification tool. CRIS also provides public access to The Registry’s verified emission reports. IETA - The International Emissions Trading Association Genève, Switzerland and ICROA - the International Carbon Reduction and Offset Alliance announced the integration of their two market-facing associations in June 2011. IETA, a carbon trade association with 160+ members from industrial and carbon market sectors, will incorporate the ICROA program into its activities. ICROA's program focuses on standard-setting and best practice among voluntary carbon offset retailers. According to IETA, its aim is to "get back into the voluntary market space in a major way." Emission permit auctioning began in September 2008, and the first three-year compliance period began in January 2009. Proceeds are used to promote energy conservation and renewable energy, although as of 2010 three states had used some of the money to balance the overall budget. All ten states have committed in their Model Rule to the sale of the vast majority of the state's carbon budget. This overcomes the problem of opportunity cost associated with the EU ETS, which led to windfall profits for generators. The struggling economy and widespread uptake of cheap natural gas in recent years have both weighed on prices and trading in the market. Carbon emissions from power plants in the 10-state region were 34% below their RGGI caps in 2009 and 27% below in 2010. Emissions prices are so low that 70% of the allowances offered at the last auction, in June 2011, went begging, even at the legal minimum price of $1.89 a ton of carbon. There's an estimated 30% surplus of allowances in the market from previous auctions, allowances plant operators so far don't need. When RGGI was created in the last decade, state officials' chief worry was driving electricity prices too high. They designed a "safety valve" by which states could sell extra allowances if the cost of the program drove prices up beyond consumers' comfort level in the New England, New York or mid-Atlantic electricity markets. That worry also drove each state to try to maximize the number of allowances available. No state wanted to lose industry because of the carbon costs, and the decision to start by applying the system only to power plants, leaving out factories and other sources of greenhouse gases, reflected that concern. High cost has not proven to be the problem. In May 2011, Gov. Chris Christie announced that New Jersey would become the first state to withdraw from a 10-state trading system, the Regional Greenhouse Gas Initiative, declaring it an ineffective way to reduce carbon dioxide emissions. The decision delighted Republicans who have introduced bills in the New Jersey Legislature to repeal a law authorizing the state’s participation in the program. But it dismayed environmental advocates, who called it a serious blow to the state’s efforts to reduce emissions from power plants and foster a shift from fossil fuels to renewable energy. The governor asserted that New Jersey was succeeding in reducing its carbon dioxide emissions not because of the multistate program, known as RGGI, but because it is relying more on natural gas and less on coal to fill its energy needs. “RGGI does nothing more than tax electricity, tax our citizens, tax our businesses, with no discernible or measurable impact upon our environment,” Mr. Christie said. Gov. Christie asserts the cost of RGGI's allowance are not expensive enough to alter behaviour from major emitters. The industry projected the cost of allowances would grow to be twenty or thirty dollars per ton; however, the current base price is under $2, not enough to push utilities to choose lower carbon solutions. RGGI first sold carbon credits on Thursday September 25, 2008 in the first of a series of quarterly online auctions. 12,565,387 allowances were sold for $3.07 per ton of carbon dioxide, bringing in $38,576,000. The latest Auction 12 on June 8, 2011 sold 42,034,184 current and 1,864,952 future allowances at $1.89 MT for a total of $25,477,200. The price is so low and power suppliers have easily met their caps because plants are taking advantage of cheap prices for natural gas, which is less polluting than coal. The auction system has raised $886.4 million to date. The original intent was for auction proceeds to help states lower emissions and cushion consumers from increased costs, and RGGI figures show 52% the auction money has gone into energy efficiency programs, 11% to aid renewables generation deployment, and 14% to aid ratepayers. But some 17% has been diverted by states to help plug the yawning budget deficits of the last two years. The top diverter has been New Jersey's Christie, who used nearly $60 million of the state's $105 million share, or 56%, for budget balancing. New York used 28% and New Hampshire, 10%. In the latter state, the governor vetoed legislation taking the state out of RGGI on grounds the state needed the money. On August 17, 2011, the remaining nine states set an agenda, going into 2012, under which they'll review the first three years' accomplishments and lessons, decide on new caps for 2012-14, and shape the program going forward. The states are: Maine, New Hampshire, Vermont, Massachusetts, Rhode Island, Connecticut, New York, Delaware and Maryland. The RGGI goal is reducing carbon emissions 10% by 2018, and the annual caps are phased toward that. Congressional Budget Office “Policy Options for Reduction of CO2 Emissions,” February 2008 - Peter Orszag (now Budget Director) and Terry Dinan of the Congressional Budget Office meticulously compared cap-and-trade with carbon tax options. They concluded that a carbon tax would reduce emissions five times more efficiently, primarily because of price volatility under a fixed cap. yah I agree, great post. I am using some of these tables in a school paper, thank you!